Take recycling to a different extreme, just in time for winter. 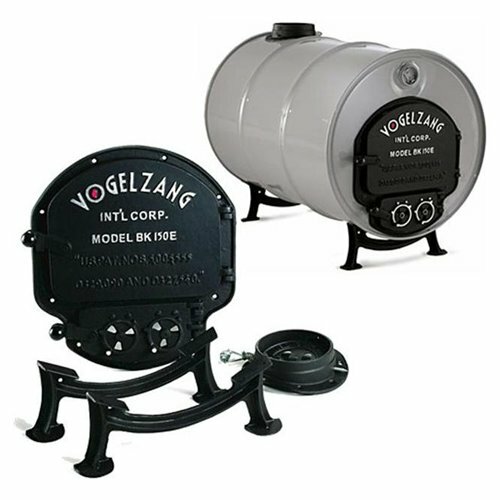 The Vogelzang Deluxe Barrel Stove Kit allows you to convert a 30 or 55 gallon oil drum into an economical and highly efficient wood burning heater that may be used indoors and out. The kit includes a well-fitted 10" by 11" feed door, solid 6" legs for your barrel, a cam-touch door latch and two weighted spin dial draft controls all made from 100 percent cast iron for extended durability. The barrel stove may be like a step back in time, but this simple concept radiates heat and is a perfect addition to your weekend cabin or ski lodge. Barrel not included.